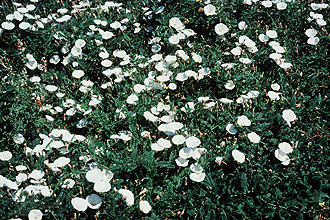 Bindweed (Convolvulus arvensis) Introduced from Eurasia. 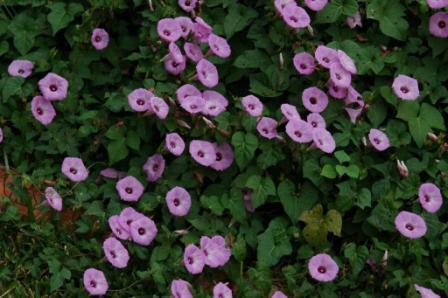 Ranked among the dozen worst perennial weeds in the world. Roots go 6’ deep, can be dormant in the soil for 30 years and still germinate. Also called wild morning glory. Control by increasing organic matter in the soil and keep removing all pieces of the plant from the soil. Q: I have Bindweed growing in my garden and fruit orchard in New Mexico. The trees in the orchard were raised organically in root sacks. Various recommendations suggest strong chemicals. P.B., New Mexico. A: Organic matter in the soil is the solution for bindweed. As you know, this morning glory relative is a very tenacious weed but a balance of humus (organic matter or broken down organic material) in the soil is the answer. Start with dry molasses and add the other products as the budget allows. Exposing the fruit trees' root flares with the air spade is the solution to get them healthy.